BB Crafts specialize in various types of ribbons such as satin ribbon, grosgrain ribbon, and organza ribbon more than a couple of years experience. Single faced satin is a narrower version of the fabric used for pew bows. Shop our thin fabric collection for your entire glitter corsage and flower needs. 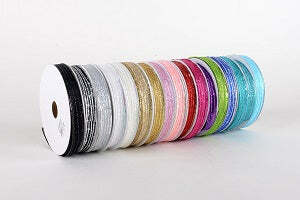 Glitter Corsage Ribbon comes in many different types of material and textures. Our wide variety of narrow satin and sheer ribbon comes in a collection of colors and is the perfect place to start when searching for Glitter corsage supplies. The Glitter corsage is a floral bunch, which is customarily worn by women either on their dress or around the wrist, at the wedding ceremony. Though, it is easier to make corsage bows with a ribbon that has a harder feel or with wired edges. It is an elegant piece of art in which the interesting energy of organza is delicately inside by three center stripes and two wide border stripes of a shiny metallic thread of deeper color tone. If you want to save money, then purchase these ribbons in bulk quantity.